Here's a post and a comment section I know you'll like. It's part of Internet Monk's reflections on an "Evangelical Liturgy." My favorite line: "Many evangelicals have little idea how noisy their services are." Psychology Today has recently started a column called The Introverts Corner, which I'm really enjoying. There is a very helpful article discussing the distinction between introversion and shyness, that differentiates between motivation for socializing versus behaviors expressed in social situations. Introverts who are not shy may have low motivation for socializing but can be skilled in social situations when it's required. Those who are shy may have a high motivation for socializing (especially if they're extroverts) but their social skills and behaviors may be inhibited, marked by fear or anxiety. I thought the launch of Introverts in the Church ought to be commemorated by the launch of a newly formatted Introverted Church. Those of you who are subscribers ought to click over to see the new template. I'll probably be tweaking for a while, so let me know if you have any suggestions. 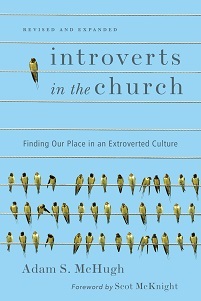 Introverts in the Church is in stock!!!! Order it directly from InterVarsity Press and get it late next week. Order it from Amazon and get it in 2-3 weeks. Addition 10/27 - The book is taking a little while to process, so IVP probably won't ship it out until early November. Amazon will ship depending on where you live and when you pre-ordered. Forgive me, the publishing process is all so new to me! How does an introvert celebrate the release of his book? 1. Big blow-out party. Not so much. 2. Gathering of a few close friends. 4. Drive to Alaska and live in an abandoned school bus. Later, die from eating poisonous berries. 6. Hold a sit-IN (get it?) at church on Sunday - during the passing of the peace/greeting time, have all the introverts remain in their seats, staring forward. Possibly sing "we shall overcome." 7. Gather a bunch of introverts to go to a public place, sit in one long row, and look at people. Just to freak them out. I should say at the outset that the author and I are friends (since we are both introverts, all this means is that we have exchanged a few emails). But as someone who has written my own book on introverts and facets of the larger culture, I am knowledgeable on the topic and am committed to thinking and writing about it with excellence and with as much objectivity as possible. When I read a book, I assess it on two criteria: 1. Does the book accomplish what it sets out to accomplish? and 2. Is what it accomplishes meaningful? After reading Living Introverted, I think the answer to both questions is yes, which is why I rate it with 5 stars. While there are outstanding books on the topic (my favorites are The Introvert Advantage and Introvert Power), most of them are lengthy and detailed. What we didn't have prior to Living Introverted is a primer on introversion, an accessible, practical introduction for those people who don't want to start with a long, research-heavy book written by a Ph.d. The author does not purport to be a psychologist or a scholar or an expert (though I think she sells herself short, as she interviewed around 100 people and does have perhaps the best blog on the topic). She uses words like "tool" and "overview" to describe her book, and that is what it is. It gives all kinds of practical descriptions and suggestions for how to live as an introvert in a world that heralds extroversion. After helpfully explaining what introversion is and what it isn't, she helps introverts with socializing, relationships, work, raising children, public speaking, saying no, and surviving the holidays (!). My favorite chapter is "What Extroverts Need to Know," an exceptionally helpful and practical guide for how introverts and extroverts can live together and learn to compromise. Not every introvert will relate to all of it, which is something the author readily admits in the introduction. I think the SJ part of her personality creeps into the pages; not all of us will relate to her description of introverts as "analytical" or "having strong organizational skills." But anyone reading my book will surely see the intuitive part of my nature shining through as well. 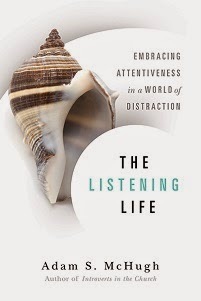 I think this book will be helpful for introverts looking for a practical, short introduction that they can immediately apply, and probably even more specifically for those introverts who are pretty deep into introversion and struggle with many social occasions. You'll notice the box on the far right sidebar entitled "About Introverts in the Church." I'll be updating that over the next few months without necessarily posting about updates. Previews: Christian Century will be printing an excerpt of chapter 6 - "The Ability to Lead" - sometime in October or November, and Christianity Today will be printing a book review sometime in the next 3 months. Check out that box regularly if you're interested! Just added to it: an interview with Christian Retailing, including my answers to the questions 1. How have introverts been overlooked in the church? and 2. Is there assumption that people who are alone are lonely and sad? (Bonus: there is a giant picture of my head there too - I'm working on getting a smaller picture). October 2009. I've been waiting for this month for 5 years. The public release of Introverts in the Church. On another level, I've been waiting for this month ever since I discovered a knack for writing when I was 10 years old. Thanks to all of you for helping this dream come true for me. I am grateful for your support, encouragement, and input over the past 2 1/2 years that this blog has been in existence. I know I'm not the best at posting and responding to comments, but I relish the opportunity to hear your thoughts and interact with you. Even if I haven't directly responded to your comment, I assure you that I have reflected on it, and many of them have greatly improved and balanced the content of the book. 2. Tell others about it - especially pastors and other leaders. 3. Read it when it arrives and review it online. Blog reviews and Amazon reviews are greatly helpful. If you review it on your blog or GoodReads, would you also copy and paste it to Amazon? You can now do video reviews on Amazon. 5. Join the Facebook fan page for Introverts in the Church. Oh, and you can now "search inside" the book on Amazon. You can see the cover, table of contents, and if you click "surprise me" it will take you to an excerpt.